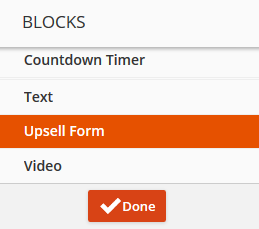 Upsell Forms are available in ONTRApages as an upsell form block, and as ONTRAforms you can embed on your own website or as a pop up on an ONTRApages sales page. Read this article to setup your global Upsell Settings and that you are aware of the requirements for Upsell Forms. Upsell Forms MUST be on the same domain and use the same payment gateway as the Order Form that triggered it. Order Forms process transactions immediately, but Upsell Forms are submitted to a processing queue that runs every 15 minutes. Depending on your global Upsell Form Settings and when the Upsell Form enters that processing queue there may be an additional delay from one to 14 minutes before the credit card is charged and the Campaigns or Rules on that Upsell Form run. Tracking scripts MUST exist on both the Order Form page and the Upsell Form page. If you are using ONTRApages, a Wordpress site that is integrated with PilotPress or Legacy Landing Pages, tracking scripts are added automatically. To learn more about adding a block to your ONTRAform, visit this article. Add items to sell. 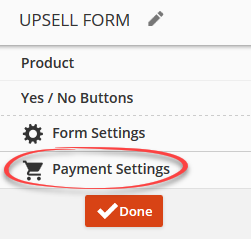 From the Canvas, select the items you'd like to sell on your Upsell Form by using the dropdown under the item column. Add multiple items by clicking the + Add Row button. If the item hasn't been created, select the + Create New from the dropdown menu. Type in the item (product) name, press tab and submit the quantity and price. Hover to the right of each item and select from the options. For detailed information on payment structures, please see this article. Charge on a later date: To charge all items on the order form on a later date, hover over the "Total" column and enter the date you'd like all charges to go through on. To remove this item, hover right and select remove charge on later date. 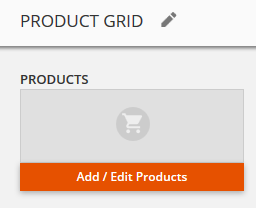 Click the + Add A Payment Method from the Product Grid in the Palette. Use the dropdown to select a payment gateway you've integrated with ONTRAPORT. Click Save at the bottom of the configuration options in the palette to save your choices. You must use the same payment gateway as the original Order Form. 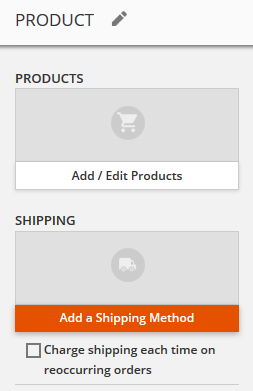 To set shipping rates for products, click + Add Shipping Method in the Palette. See this article for detailed information about adding shipping methods. Click the + Add A Tax option from the Palette. See this article to learn how to add taxes percentage for each tax option. Enter a name and tax percentage for each tax option. You can specify different amounts for each type of tax and add as many tax options as you like. Select Invoice Template (optional): Use the pulldown to select the invoice template customers will receive upon successfully purchasing your products. To create custom invoice templates, see this article.